Hang out with Joe and Carl and many others from the cast and crew on a luxury cruise. We're continuing to add new programs as well as first-time and returning cast & crew members, including Detective Larry Martin and Detective Brian Ritz (along with Mrs. Ritz)! 6 days / 5 nights on the lovely and luxurious Regal Princess! 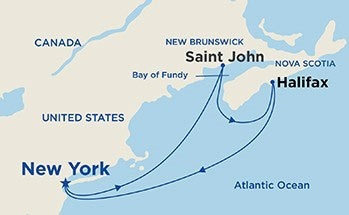 Departing at 5PM on October 26, 2019 from New York City, New York, we will cruise to Saint John and Halifax in Canada, until we return to New York City on October 31, 2019 at 7 AM. You'll be treated to round-the-clock gourmet cuisine, all included in the low cost of the cruise! We also offer free roommate matching with someone of the same gender, close to your age! An All-Access Pass to Q&A sessions with Lt. Joe Kenda and Carl Marino. A photo op with Joe and Carl for you and your traveling companion. Valuable souvenir gifts, including a "Kenda Cruise" T-shirt. Accommodations in a prime location aboard the lovely and luxurious Regal Princess. All meals, full production shows, and more.